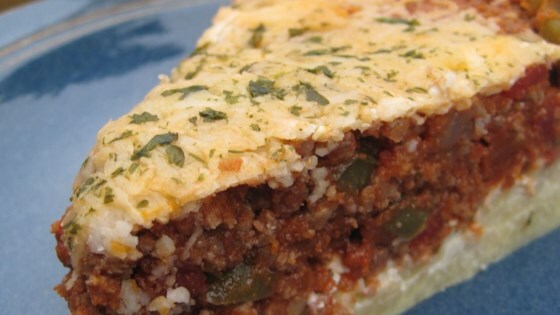 "The crust is made from spaghetti and then layered with cheeses, meat and sauce. Mm, mm!" Cook spaghetti in water with 2 teaspoons salt and 1 tablespoon oil until tender but still firm. Drain. Add eggs, Parmesan cheese, and butter. Mix and shape into a crust in a greased 10-inch pie plate or springform pan. Spread cottage cheese over crust. Preheat oven to 350 degrees F (175 degrees C). Heat 1 tablespoon vegetable oil in a large skillet over medium-high heat. Cook and stir the beef, onion, and green pepper until beef is thoroughly browned. Mix in tomatoes, tomato paste, sugar, oregano, 1/2 teaspoon salt, and garlic powder. Spread mixture over cottage cheese. Bake uncovered in preheated oven for 30 minutes. Sprinkle with mozzarella cheese and bake 5 to 10 minutes more, until cheese is bubbly and beginning to brown. Turn squash into spaghetti for a delicious dish even non-Paleo friends will love! Very Good! One of few recipes that my husband and I agree on. I substituted ricotta cheese for the cottage cheese and sausage for the ground beef and it was wonderful! My picky boyfriend even liked it. This recipe is a family favorite and fairly easy. We prefer skim Ricotta with a bit of oregano, basil, and garlic mixed in, rather than the cottage cheese. Excellent recipe Kimberley, thanks!